Remember that campaign from IKEA, where a Facebook profile was created, and over a two-week period, the agency uploaded images from IKEA showrooms to a Facebook photo album? First, who managed to tag his name to a product, won it. Recently, things turned a bit around. We don’t have to tag our names, but rather tag a product in your pictures. Facebook added this functionality on March 11 and many questions popped-up: are they want to make it automatic, so big brands could tag it for you, which is in fact called real-life product placement? Is this another attempt to monetize the social interactions by giving a phantom increase in functionality? And finally, will people actually volunteer to tag any product in their photo album sacrificing their personal image? Building and maintaining personal online identity becomes more important. Not only celebrities, but rather your close circle of friends (jury of coolness) can affect your behavior and indirectly force you to buy certain product. Facebook example seems to be just another nail in the coffin of privacy and our authentic memories. The keynote given by Aza Raskin for the John Seely Brown Symposium on Technology and Society at University of Michigan and his inspiring speech at PICNIC’10 basically reflected identical ideas – our personal past will be rewritten by the marketer. We are all in danger of having our memories hacked and our past is not immutable anymore. Will you let your life be edited? Will you let any brand to change some details on your pictures (add a hot girl with a crate of Budweiser maybe?). 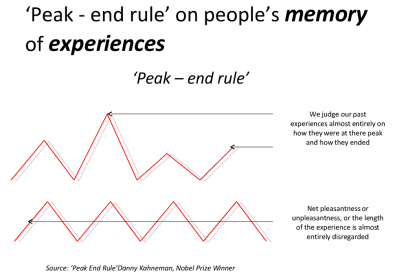 According to the peak-end rule, we judge our past experience entirely on their emotional peak (bad or good, doesn’t matter) and how it ended. So, what do you think? Will you let your life be edited by brands, swap negative peak with positive one making your overall past experience/memories remarkable? Let us know in the comments.